Motorcyclists can be particularly vulnerable to serious injury in the event of an accident. There's no steel frame, body with crumple zones, air bags, or restraint systems to protect them from an impact. In fact, according to the National Highway Transportation and Safety Administration, more than 80 percent of all reported motorcycle crashes result in injury or death to the motorcyclist. If your motorcycle accident was due to the negligence of another person or driver, you could be entitled to compensation for your injuries. Our San Antonio motorcycle accident attorneys are here to make sure you don't pay the price for the actions of someone else. As our client, you will pay nothing unless we win your motorcycle injury case. Call Zinda Law Group today at (800) 863-5312 for a free consultation with one of our experienced San Antonio motorcycle injury lawyers. A motorcycle presents a far smaller profile than a passenger vehicle, making it especially difficult to see. That's why most motorcycle crashes in San Antonio occur when the driver of the other vehicle is turning in an intersection or changing lanes. The motorist almost always admits that they never saw the motorcycle approaching, or that they saw it when it was too late. Motorcycle wrecks can be life-changing and can occur in many ways. No matter the circumstances of your accident, call the San Antonio motorcycle injury lawyers at Zinda Law Group to determine if you have a case. 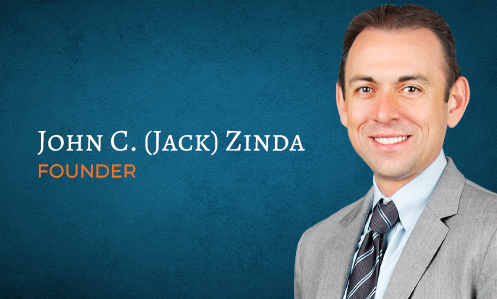 At Zinda Law Group, our team of experienced and successful motorcycle accident lawyers are willing to fight for you. Our attorneys can help you understand how to negotiate a motorcycle accident claim with an insurance company. We are fully aware of what insurers and claims adjusters might do to try and shift liability for a motorcycle accident over onto the motorcyclist. An insurer might want a statement, but you shouldn't give one without first speaking to a motorcycle injury attorney. The law doesn't require you to give a statement, and the opposing insurer will only try to use that statement against you in the future. Our legal team has helped thousands of injury victims get their lives back on track after an accident. We have the knowledge and resources necessary to help you pursue maximum compensation for medical bills, lost income, property damage, pain and suffering, and all the other ways the accident has impacted your life. We also believe that a motorcycle accident victim should never have to worry about being able to afford superior legal representation. That is why we offer 100% free consultations, and why you will pay nothing unless we win your case. That's our No Fee Guarantee. If you were injured or a loved one died in a motorcycle accident in or around San Antonio, don't wait too long to contact the personal injury attorneys at Zinda Law Group. The law imposes strict time limitations, and evidence can get lost or disappear. As the victim of an accident, you deserve full and fair compensation. Call Zinda Law Group today at (800) 863-5312 for a free consultation with a skilled San Antonio motorcycle accident lawyer.